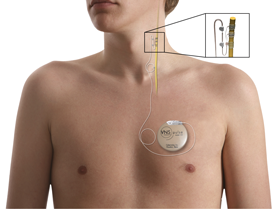 Well, Evs is now the proud owner of a Cyberonics Demipulse Model 103 VNS (Vagus Nerve Stimulator) implant. In very short, it's essentially a pacemaker for the brain. Her surgery was Monday morning (19-Jul) - technically neurosurgery, and thus performed by a neurosurgeon, but they never had to touch her cute little head. ;-) It's 2 small incisions; one in her neck, and the other in her chest (see illustration). More information can be found on Cyberonics' website - but very basically, the device sends electrical pulses to the brain via the left vagus nerve. As with most seizure treatments (anti-convulsant drugs, ketogenic diet - etc) - "they don't quite know exactly how it works", but it can both help prevent seizures, by sending electrical pulses through the vagus nerve to her brain, as well as when she has a seizure - it can be used to "interrupt" it, by a magnet-activated switch. At any rate, the surgery was relatively easy, as far as surgeries go - normally, it's actually an outpatient procedure, or doesn't typically require a stay overnight. However, due to Evelyn's recent respiratory issues, we had already planned with her doctors to keep her a night. After the procedure, she did have a hard time coming off the ventilator - The anesthesiologist & recovery team brought me back to help try her on her Bi-PAP for a little bit (fitting the mask is a bit of a learned art), but between irritation, agitation, and leftover anesthesia keeping her airway a little floppy, she had to be re-intubated for the next day. She (and Kim & I) spent the rest of Monday in the PICU. Around 10AM the following day (Tue 20-Jul), Evs was extubated without much issue, and had a pretty relaxed day (as relaxing as the PICU can be) - mostly involving sleeping to Tinkerbell. ;-) We were discharged Wednesday morning, also without much event.